The Ace of Wands symbolizes a sudden manifestation of faith, belief, strength and personal power. No card is more positive for the beginning of an enterprise, when simple courage, ambition and self-confidence are driving a project forward into manifestation. The Ace cards represent a sudden gift of energy which cannot be manufactured or summoned by an individual. It is a gift from the universe, taking the shape of a forceful leader or helper who embodies enthusiasm, charisma and courageous enterprise, or a shift in your inner state of being. You may experience a radical increase in physical energy or sexual drive, for this card represents the very energy of life that animates the physical body and human spirit, or the Ace of Wands card may represent a new opportunity for creativity, adventure, self-empowerment or sexual expression. These opportunities may involve risk or require courage and determination, but you are now uniquely equipped to navigate such situations now and rise to the occasion. You may be the recipient of sudden inspired solutions or inventions. Alternatively, you may feel feisty, aggressive and eager for certain kinds of competition or even conflict. Use this zeal and assertiveness to propel yourself forcefully toward your goals, and proceed with courage, creativity, enthusiasm, faith, hope and optimism, all of which you probably have great reserves of now. The eight leaves which fall from the powerfully blossoming Wand suggest the eighth suit of the Major Arcana, Strength, reinforcing the themes of virility, force and sexual potency. As with any card—but especially with the four Aces—one must beware of overextending or relying too heavily on the powers of the card. In this case, taking these qualities to the extreme can manifest as arrogance, pig-headedness, or dreaming too big without being practical or following through on the work. The Wands suit is especially prone to initiating or igniting enterprises, but then abandoning them mid-process, when inspiration, courage and self-assertion are no longer as necessary as practicality, discipline and the ability to adapt the ideal to the demands of reality. The Ace of Wands card is connected to the Sun / Mars as a symbol of courage, determination and readiness to take risks. The Ace of Wands card can represent new beginnings in your life if you are bold and follow your inspiration toward something new. The Ace of Wands card can represent new life or birth, through new opportunities or even the birth of a baby. Now is a good time to turn all the potentials in your life into realities. When the Ace of Wands card is reversed, it can indicate that new beginnings are being blocked in your life, or that somethings may be coming to an end. You may find that your ideas do not seem to stick and you are not experiencing growth in your life, which may be clouding your joy. 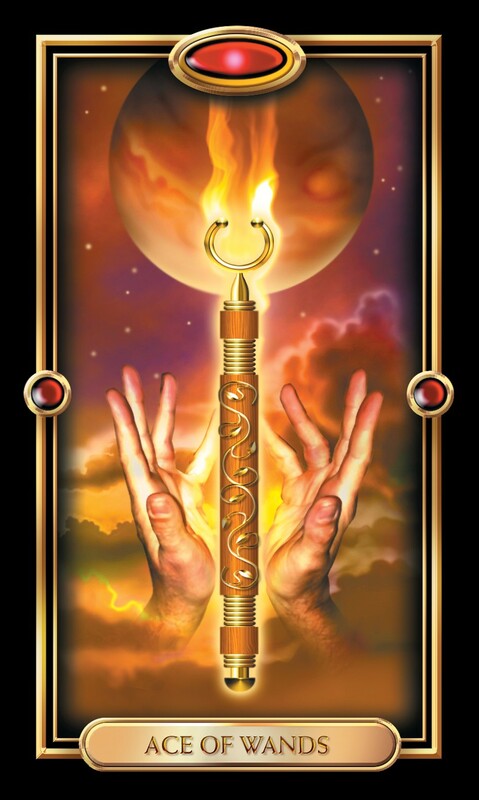 The Ace of Wands card can indicate that new and positive things are going to happen in your work life. You may need to be bold and ask for the things you want in your career, and you are likely to achieve success that you’d only dreamt about in the past. The Ace of Wands card can mean new beginnings in your love life as well. You may begin a new romantic relationship if you are open to love in whatever ways make the most sense for your happiness. If you are already committed, you may experience new levels of understanding and expression with your partner. The Ace of Wands card can signify that things in your financial life are likely to take a turn for the better through wealth that may come to you from unexpected sources. Your gifts of new wealth may not always be monetary, but may be things you value and treasure. The Ace of Wands card can represent a new spiritual influence in your life. You may need to remember that your mind and body are closely linked, and will impact one another vastly as you seek spiritual growth. You may look for a new spiritual role model to help guide your journey.